Hardly ever can Boston sports fans claim to be excited about what a player on a Philadelphia team does, but Sunday was one of those exceptions. 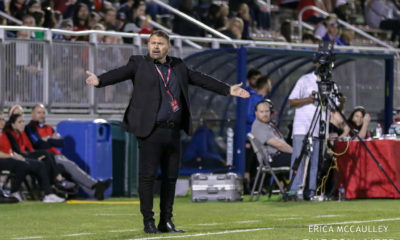 With the match between the Philadelphia Independence and Sky Blue FC tied heading into stoppage time, it looked like the Boston Breakers’ season was over. The Breakers (4-9-4, 16 pts.) needed Sky Blue FC to lose to keep their playoff hopes alive heading into the final week of play. Sky Blue FC (5-8-4, 19 pts.) looked like it was going to pull out a 1-1 draw against the odds. 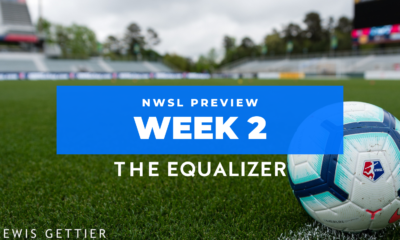 Sky Blue FC was reduced to 10 players in the 51st minute when defender Carrie Dew was sent off for her second yellow card, but the visitors played through the numbers disadvantage valiantly. Goalkeeper Jenni Branam made 11 saves – several of which were from point-blank range – and played out of her mind. 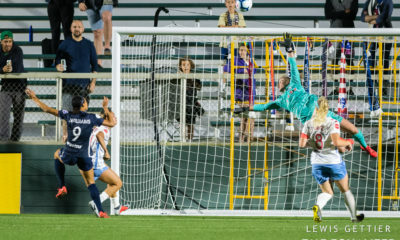 It looked like she was about to save the game and Sky Blue FC’s season. And then Lianne Sanderson struck. After a scrum in front of net, Sanderson buried the ball into the goal in the first minute of second half stoppage time to give Philadelphia a 2-1 victory. Branam was irate, claiming that Joanna Lohman kicked the ball out of her hand. More curiously, Sanderson was in an offside position (behind Branam and in front of defender Danielle Johnson) when she scored. But the argument was irrelevant at that point. Philly had escaped with victory. It now sets up a Sunday, August 14 battle in which Boston hosts Sky Blue FC in essentially a winner-take-all match for the final playoff spot. A Breakers win will put Boston into the playoffs via the second tiebreaker of head-to-head goal differential. That is currently tied, so a Breakers victory not only brings the team level on points with Boston but also gives the Breakers the head-to-head goal differential advantage. Not to be f0rgotten is that Philly’s victory keeps the team in the race for first with the Western New York Flash. Those two teams are currently tied on 36 pts., but Western New York has a game in hand. That will be played out on Wednesday in Florida against magicJack. All six teams are in action on the final day of WPS play on Sunday. Boston hosts Sky Blue FC at 4 p.m. ET, magicJack hosts Philadelphia at 4 p.m. ET and Western New York hosts the Atlanta Beat at 6 p.m. on Fox Soccer. Boston has once before had a make or break game at Harvard Stadium on the final day of the regular season. Boston needed a win heading into its August 9, 2009 game against the league-leading LA Sol. Kelly Smith scored in the 18th minute on that day but a second half Marta goal and a Shannon Boxx penalty kick in stoppage time sunk the Breakers and put, you guessed it, Sky Blue FC into the playoffs. Sky Blue FC would win three-straight games and claim the inaugural WPS Championship. Sunday, Sky Blue FC will have to actually take on Boston to keep the Breakers out of the playoffs. 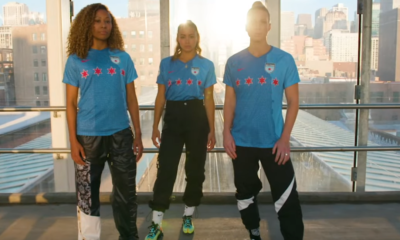 And Sky Blue FC will have to do so without defender Carrie Dew, who had played every minute of the season up until that red card against Philadelphia.